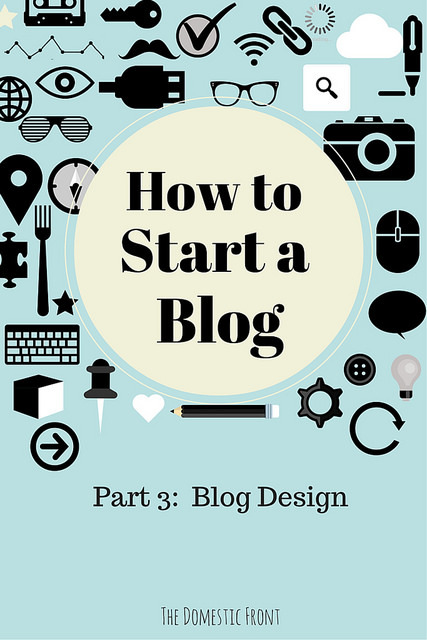 This is part 3 in a 5 part series on How to Start a Blog. This post will deal with blog design and the elements to include. Also see Part 1 – Choosing a Blog Name, Part 2 – Choosing a Platform and a Blog Host, Part 4 – Creating Great Blog Content, and Part 5 – Promoting your Blog. Now that you have a blog and a place to put it, you might want to start thinking about what your blog is going to look like. Web design is a huge business, and I do not pretend to be an expert, but I do have a few pointers in this area. When you set up your blog, on WordPress or Blogger or wherever, you will be prompted to pick a theme. A theme is really just the building block for hyour blog design. If you’re familiar with coding, you can adjust your theme to look nearly however you want, but it’s best to start with a theme that’s close to what you want in the beginning. Here are some things to think about when choosing a theme. Look. Whatever you do, pick a theme with a fairly minimalist color scheme – it’s easier on the eyes, looks cleaner and more professional, and will make your content pop. Remember MySpace? Where people decorated their profiles in any manner of horrible designs? Where’s MySpace now? That’s right, it has been essentially replaced by Facebook, where everyone’s profile is blue and gray and white and uniform. It’s not boring to have a plain web design – it’s good sense – it makes the blog less confusing and more readable. In my opinion, you can’t go wrong with black text on a white background, though white on black can also work. Layout. You’re going to want at least one sidebar on your blog. A sidebar holds things like ad units, navigation, introductions – these are called widgets (more on those later). Sidebars are static while your main page changes (so are headers, but if you put all your stuff into a header, your content will be lost beneath it.) The number of sidebars is up to you – some people do one sidebar only, or two sidebars on one side, or one sidebar on either side (which is the layout on The Domestic Front.) I’d shy away from having more than two total, though, for the minimalism reasons I cite above. Responsiveness. Responsiveness is how a website layout changes depending on which device you view it from. Some themes offer responsive design – they have a different layout on a smartphone than they do on a desktop. A non responsive design will make everything smaller. As more people view the web from mobile devices, how your theme appears on such devices becomes increasingly important. On The Domestic Front, I use the free theme Atahualpa, which has the advantages of being free, very customizable, and well-supported. It is not responsive though, and that’s why there’s a mobile view that uses a different theme (Montezuma, from the makers of Atahualpa). I like Atahualpa because I can do a lot of customizations with a menu in the wordpress dashboard, rather than going into the code editor. I don’t like it because sometimes I need to go into the code editor, and Atahualpa is so flexible that there are a lot more moving pieces than there are in a simpler theme. To choose or change your theme in wordpress, you go to themes under the appearance menu from the dashboard. You can search for available themes from that menu, and add them to your database from there. Once you have your theme, you want to think about the elements of your blog design that you will include in the framework of your theme. These are some essential elements that should be included in any design. Elements included in the sidebar are called widgets. Header. I touched on this before, but most themes come with the ability to add some sort of header across the top of your blog. The header should include your blog name and/or logo, so people know where they are. A logo doesn’t have to be fancy- it can simply be your blog name, written out. When you’re designing your header, think about the first impressions it makes of your blog. Navigation. This is huge. You’re going to have great content, and you want people to be able to find that content. On The Domestic Front, you can find content through the category menus that drop down across the bottom of the header, the dropdown archives in the left sidebar, the search box in the left sidebar, or the recipe and post index which is linked at the top (with the other pages.) I want to make my content easy for people to explore. I should probably also have a tag cloud, but I think they look to messy. A Search Box. This is really a subset of navigation, but if you don’t have ANYTHING ELSE on your site, have a search box. Wordpress comes with a search widget pre-installed and available to incorporate in your design. Use it! About Pages. Every blog should have an about page, where people can find out more about you and what the mission of the blog is. I have two – the small widget in the right sidebar and the page that links from the top menu. Your about page should also contain an email address if pe0ple want to contact you directly, and ideally your contact information should be available on the front page of your blog. Fonts – you want your blog posts to be readable. Don’t use a script font. Also, don’t use Comic Sans or people WILL make fun of you. Links – it’s good form to include a blogroll of links to other blogs in your niche. Many people don’t nowadays, but it’s a nice way to be part of a blogging community. Social Media – I suppose you could have a blog without the corresponding social media accounts, but it’s probably not the best idea. Make sure that people on your blog know how to find you elsewhere. Posts per Page – Think about how many posts per page you want to display – more will cause your site to load more slowly and give people an “infinite scrolly” disease. I think the best is between 3 and 5 for longer posts, and no more than 10 for shorter posts or excerpts. If you include full-sized photos in your posts that appear on the front page (some themes allow thumbnails), limit it to 5.